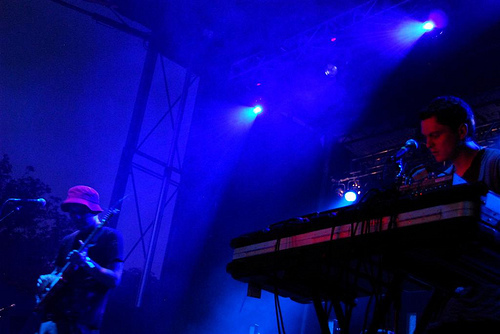 I saw Animal Collective live at the Pitchfork festival in 2008, and it was like no concert I had ever seen or heard. I stood in the same place for hours in order to get a good spot to see the band which I hardly knew well save for their at that point latest album, Strawberry Jam. In the sea of hipsters, I felt like a faux-hipster, not knowing what to expect, somehow at fault for his fascination and curiosity with a band that he had close to no knowledge of despite the fact that they already had a devoted following since the turn of the century. I felt ashamed to want to hear the more melodic songs at the concert. I was afraid of being ridiculed because I had wanted to hear the hits. My insecurities would be sorted out in due time (actually with Panda Bear’s 2007 solo album Person Pitch which dealt with musical elitism head on), but at that point in time what was important was what I was hearing, and I couldn’t even tell what that was. The concert was a complete sensory overload. I felt as if the concert was so loud, so dense, so invasive of my brain that I literally could not hear what I was hearing. It sounds strange, but I was completely enveloped by the music. It felt like I was inside the music, as opposed to the music going inside of my ears and being inside me. I was not even completely sure if I liked it at the time, but I knew that what I was listening to was catchy, and I was too fascinated to want it to stop. About half of that concert’s setlist consisted of songs that would later be on Merriweather Post Pavilion (named after the legendary Maryland concert venue), which is arguably the album that everyone has been waiting for the band to make for almost ten years. With that said, comparing any Animal Collective album to any other is risky business. Merriweather is their ninth, and almost all of them are unique, although their progression makes sense and they share certain qualities. Starting from free form electronic, moving through noisy, improvisational psychedelia, folk, pop, and guitar rock, Animal Collective seem to have done it all, but they have developed and retained distinctive styles throughout their career. Observers have tried to condense these avant garde tendencies, just a few being rhythm-less guitar strumming, conversely rhythmic hooks, and drastic dynamics, into the label “freak folk,” but pinning a genre on the band seems futile, because they are always trying new things and moving in different directions. The core of the band has always been Noah Lennox (otherwise known as Panda Bear) and David Portner (Avey Tare), with other members Brian Weitz (The Geologist) and Josh Dibb (Deakin) joining in early on. The band’s lineup has changed since their last album, 2007s more guitar based Strawberry Jam, with the (presumably temporary) departure of guitarist Deakin. The concert I attended in 2008 was with this lineup, Panda Bear, Avey Tare and the Geologist, and primarily an electronic show. The spirit of the band’s live show is a thorough and accurate representation of Merriweather Post Pavilion’s style. Songs are thickly layered with sampled sounds of all kinds, everything from the more standard tools of the trade such as drums, guitars, and pianos, to bizarre electronic samples, found sounds, and foreign instruments. This technique has been honed by the band since their earliest days, but it seems to be a perfected art here, with more pleasing things going on at any given time than one can distinguish or separate. Particularly impenetrable are Daily Routine, Panda Bear’s sonic representation of a morning out with his daughter, and Also Frightened, which sounds like an electronic acid drenched rainforest. But this sonic complexity actually feels quite down to earth, for several reasons. One of which is the band’s melodic maturity. 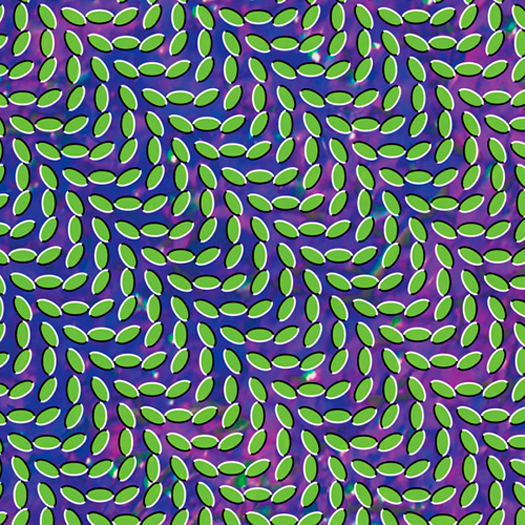 Earlier Animal Collective albums often ran with numerous musical ideas and hooks in the same song somewhat linearly, often separately. On Merriweather, the band run with the catchiest melodies and simultaneously lean on their production without ever simply relying on it. The most notable example of capitalization of melody is the album’s second song and first single, My Girls, primarily a Panda Bear song. The production here is excellent – the rhythmic arpeggios and low bass blasts are something that was hinted at on Strawberry Jam but are brought to their full potential here – but the song’s primary feature is that you would be hard pressed to find a more catchy song in the band’s catalog. The album’s centerpiece is Bluish, conversely more of an Avey Tare piece, which utilizes an absolutely lovely synthesizer melody alongside lush clicks and whirs and held up by a heart thumping rhythm, and ends up being Animal Collective’s cutest song to date. Just about every song, no, sound, on this album will make you smile. Both of the aforementioned songs, and at that a majority of the songs on Merriweather Post Pavilion, feature shared vocal responsibilities from Panda Bear and Avey Tare. Animal Collective have always been about the unique melodic and vocal styles of Avey Tare and Panda Bear, and on this album, these styles blend perfectly. The two bounce main hooks off of one another on a song by song basis, but it is clear that each member of the band has a key role in just about each song. It is difficult to tell who does what, but from examining the solo work of Panda Bear and Avey Tare in relation to Animal Collective’s catalog, it becomes clear what each member of the band, including the Geologist, bring to the table. And they bring quite a lot. Merriweather Post Pavilion is a blend of countless ideas, old and new. Lyrically, Panda Bear and Avey Tare have also matured. Panda has always been a bit more down to earth than Avey, but his lyrics reached drum-tight focus on Person Pitch, where they were almost conversational. Although Avey’s lyrics are still whimsical and focused on imagery, he has followed Panda towards a more tangible lyrical style, most recognizably with his romantic musings on Bluish. But Avey’s greatest moment might be Lion In a Coma, a multifaceted percussive song. It probably gets the closest to bizarre as any other song on the album, but Avey’s lyrics are spot on; just bizarre enough to be fun but also touchingly yearning and sensitive. Conversely, Panda Bear’s finest moment comes last with Brother Sport, on which Panda engages in a completely new catharsis, specifically, dance until you drop. It explodes into Animal Collective’s most memorable song from the start, riding waves through hook after hook until a dramatic Boredoms-esque psychedelic freakout, in which it seems like just about every animal in the zoo got a musical instrument and everybody went wild at the same time, in perfect synchronization. Meanwhile, a sound collage cascades down from the sky and Panda chants “Halfway to fully grown/you’ve got a real good shot/won’t help to hold inside/keep it real, keep it real, shout out.” It’s the sound of a band who wants to do everything at once and has the experience and maturity to do so without sounding contrived or muddy. But this song is just one of many on an adventurous pop album where everything is carefully considered, and all of Animal Collective’s tools come together to make something utterly unique and irresistible, their best and most fun album to date.